Tsutaya Premium, a Netflix-style service where you can rent as many DVDs as you want for 1000 yen a month, has announced a new campaign called Pokemon Fair. During the campaign period from July 13 to August 31, 2018, Tsutaya Premium subscription will be sold as a bundle with an original tote bag. This bundle is limited to 150,000 sets in Japan. A special lottery will be held for Tsutaya Premium members with no strings attached. 50 lucky winners will win a copy of Pokemon Let’s GO Pikachu, another 50 for Pokemon Let’s GO Eevee, and 500 will bring home 500 Tsutaya Points. And of course, you can watch all 19 previously released Pokemon Movies, as Tsutaya Premium has them all. 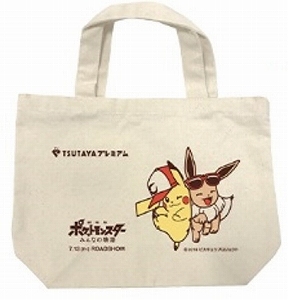 Check out the commercial for Tsutaya Premium Pokemon Fair below. Visit the official site.